Mr. Bernhardt: Gergo update: Bodges, Bodges everywhere! Gergo update: Bodges, Bodges everywhere! Noun. bodge (plural bodges) A clumsy or inelegant job, usually a temporary repair; a patch, a repair. Good news! Things are coming together at a (slower then I'd like) pace, but progress is being made. Although there have been setbacks and bodges applied to keep development going. 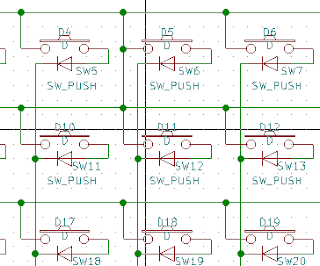 - The footprint I made for the SSOP-24 MCP23018 put VCC on pin 1, and ground on pin 10. That should have been flipped. A few bent leads and wires around the board works though. Thought it was weird that I was getting double presses, that wasn't software though. Aight, maybe I can cut a trace? Nope, the autorouter worked some serious voodoo optimizing that section. NEVER TRUST THE AUTOROUTER. So needless to say, those are getting fixed and a new fresh batch of dev PCBs will be on it's way. Thankfully DHL is pretty damn fast. There's still a bunch of stuff I can work on while it's on it's way. Apart from those minor setbacks, everything is proceding at a decent pace. Stay tuned for updates! 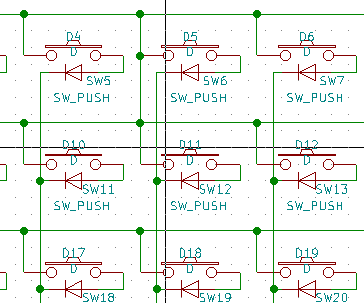 Edit: Upon actually looking at USB-C connectors, I don't honestly think your average person can get that attached to a board without a ton of bridges and headache. I'm throwing enough at the assembler with that TQFP and SSOP package. The real hard part is the trackball, but if that can't be done it can just be replaced with a switch. If I'm reflowing them myself that's one thing, but it's just too much for so little gain.